For an incredible adventure in a truly diverse continent, book your cycling holiday in Africa. This amazing land has much to offer with stunning scenery that will not be found anywhere else on the planet. Africa’s sheer size provides incredible diversity with varying climates, from the grass lands of the Savannas, to tropical forests, arid deserts and snow capped mountains. Exploring Africa on two wheels is the best way to appreciate its many wonders and the warm and generous hospitality of the African people. There are of course, no-go zones in Africa and some of the super cities have high levels of crime such as Johannesburg in South Africa and Lagos in Nigeria. However, contrary to common beliefs – Africa is on the whole, a safe and hospitable place for cyclists. Expansive stretches of coastline surround the African continent – the Atlantic Ocean on the west coast meets the east coast’s Indian Ocean on the Western Cape of South Africa. It is here that the breathtaking ride along the iconic Garden route begins in the shadows of Cape Town’s famous landmark, the Table Top Mountain. The Garden Route is a fascinating mix of ecosystems – this natural playground attracts thousands of avid cyclists every year and it is easy to understand why. 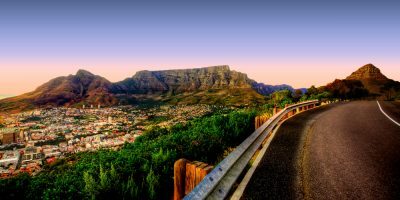 South Africa is a great starting point for cycling holidays in Africa, it boasts many natural wonders, an agreeable climate with guaranteed sunshine as well as political stability. The magnificent strip of coastline known as the Garden Route, is an expansive national park connecting two other significant national parks – the ancient forests of the Tsitsikamma National Park with the wild coastline and lakes of the Wilderness National Park. It provides the opportunity to explore some of the most ancient forests in the world and witness wildlife that most people could only dream of seeing in their natural habitat – zebra, ostrich, baboons and the occasional elephant may all be spotted as you cycle. The coastline, without a doubt, offers some of the most stunning beaches in the world and is a famous location for shore spotting migrating whales (the Southern Right whales and Humpback whales), as well as common and Bottlenose dolphins and even, on occasions, orca. This trip is suitable for moderately fit cyclists, with cycling distances between 60 and 70 miles per day – it also involves some reasonably challenging climbs. The exciting journey comes to an end in the Eastern Cape in the town of Port Elizabeth.